Wyeside Arts Centre Arts CentreSet in the heart of mid Wales, and perched upon the brink of the picturesque river Wye in the market town of Builth Wells, Wyeside Arts Centre is a presenting venue for live and visual arts and cinema. Wyeside’s varied programme ranges from Cerys Matthews to Tchaikovsky and from Pinter to panto – with the likes of Lucy Porter at the microphone or Courtney Pine on sax. These highlights reflect the centre's fundamental commitment to presenting a programme of arts and entertainment of real breadth and quality, that is accessible to all people. Extensively modernised over recent years, this busy Arts Centre offers full Live Show, Cinema, Gallery Workshop programmes. 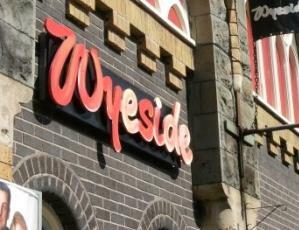 The Wyeside can also offer a full range of conference and hire facilities.